"Crunchy, chocolaty, and totally guilt-free drop cookies that look decadent but are super easy to make! 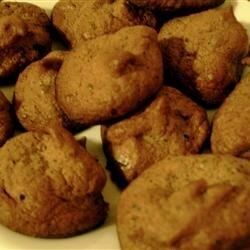 Stevia sugar substitute makes these cookies nearly sugar free, and egg whites make them low fat as well. Put them in the refrigerator or freezer to make them last up to several weeks." Combine egg whites, espresso, vanilla extract, and cream of tartar in the bowl of a stand mixer fitted with the whisk attachment. Beat until egg whites begin to form soft peaks, about 2 minutes. Slowly mix in sugar and stevia powder. Continue to beat until meringue becomes glossy and stiff peaks form. Gently fold cocoa powder, cacao nibs, and coffee grounds into the meringue. Drop spoonfuls of the mixture onto an ungreased baking sheet. Bake in the preheated oven until tops start to turn golden and crispy, about 30 minutes. If you don't like the taste of coffee, just prepare without the brewed espresso and the coffee grounds. Still a decadent chocolate meringue cookie! Substitute mini chocolate chips for the cacao nibs if desired.